From the first exploration of Egyptian “Tomb to Womb” theory 30 years ago, to the most recent developments in my studio, my visual language remains consistent. 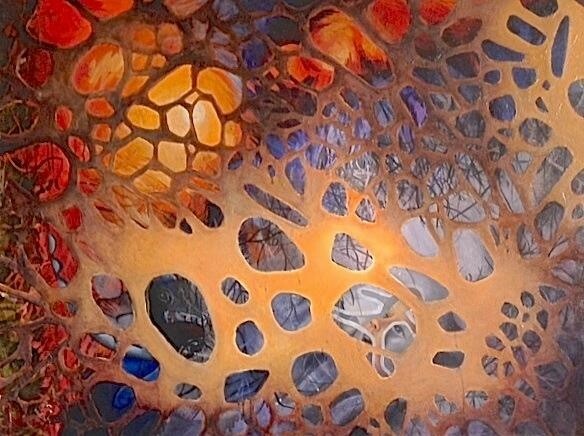 Cells, Stained Glass, and a Grandmother’s Lace run through controlled spills, each representing the transparent layers of time. This body of work explores the line that separates the tomb and the womb. The division of space and time. The division of Heaven and Earth. Since the suicide death of my son, my mind has not left that space. I am in a million little pieces between here and there. Feet firmly planted, but I long to be with him. The division becomes less clear. This flesh, merely a temporary shelter. This life, just a vehicle. Gallery hours are generally Monday – Friday, 8:30am – 4:00pm or by appointment. If you are an artist in the Capital District interested in exhibiting work, contact our Curator Kelly Grimaldi at [email protected], or (518) 350-7679.